New research has confirmed the world-famous Piccadilly Lights, owned by Landsec, is a modern global landmark and prestigious brand advertising platform which engages positively with audiences on an emotional level. The annual study was conducted by digital out-of-home media owner Ocean which operates the Lights. It maps the growing popularity of the Piccadilly Circus London screen as a powerful, safe and trusted advertising medium which builds consumer brand confidence. Ocean’s attitudinal survey of 400 people compares responses to the first wave of research which was conducted shortly after the new Lights were switched back on in October 2017. Transforming the iconic advertising display into a responsive entertainment destination supports the hypothesis that the Piccadilly Lights grows and amplifies brand perception and fame. Brand recall for resident advertisers registers 88 percent for Coca-Cola and 82 percent for Samsung. It’s increasing for shorter term advertisers as well, with a 20 percent uplift. Perceptions are growing too. Brands featured on the Lights are classified as “Prestigious” (82 percent up from 70 percent), “First class” (68 percent up from 62 percent) and “Big” (83 percent, up from 79 percent). 48 percent said they felt “more confident about the brand” displayed on the Lights (up from 46 percent in 2017) suggesting people regards the Lights as a safe and trusted platform. Advertisers are perceived as “Global” (55 percent), “Industry leaders” (41 percent), “High tech” (40 percent) and “Fashionable” (38 percent). 25 percent classed the brands as “Trendsetters”, up from 11 percent in 2017. One in five people visit Piccadilly Circus just to take a picture of the advertising display (up from 16 percent in 2017). 31 percent visit because it’s a global landmark of historical interest. 86 percent considered the screen “Iconic”, up from 83 percent in 2017 and “Modern” (93 percent). 95 percent agreed it was the kind of advertising they would expect in a global city. 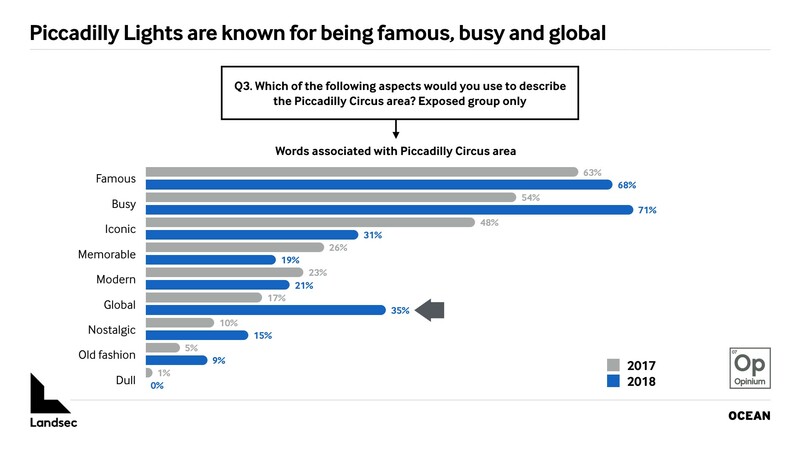 The attributes most closely associate with Piccadilly Circus are “Big” (71 percent) and “Famous” (68 percent). 35 percent described the Lights as “Global”, up from 17 percent last year. Fewer people thought the screen “flashy” (28 percent, down from 39 percent) or “cluttered” (18 percent, down from 23 percent), suggesting a growing familiarity because people have seen the Lights in the press, on the TV or frequently in person. Most people (35 percent) said they visit Piccadilly Circus to eat and drink, but close to a third (28 percent) said they go there to shop. Ocean chief marketing officer Richard Malton said: “By mapping the attitudes and mindsets of Piccadilly’s diverse audiences, we have captured how well resident and shorter term advertisers are remembered and perceived. Christine Baldwin, head of portfolio management at Landsec, said: “The Piccadilly Lights is an iconic symbol within the capital, and it’s great to see that people continue to think of featured brands as both prestigious and first-class within their industries. This goes to show the immense opportunity that advertising on Piccadilly Lights offers to brands of all shapes and sizes, providing a platform where up-and-coming businesses can sit directly alongside household names. “With the marketing mix more varied than ever before, it’s encouraging to see that a premium location never goes out of fashion – and that out-of-home can be just as exciting as other forms of advertising. But it doesn’t have to be a case of ‘either, or’ when it comes to marketing a product – the right campaign advertised on Piccadilly Lights can succeed on social media, too. Emotional impact is also evidenced by the positive sentiment of Twitter posts like those generated by Victoria Beckham’s decision to use the Lights to broadcast her debut London Fashion Week show. Ocean measured the reach and sentiment of content shared by fans on their social channels (source: Pulse). Twitter posts delivered 6.11 million impressions and recorded a near perfect score for “Joy” (95 percent) on the sentiment index. The second wave study was conducted for Ocean by Opinium. Fieldwork was conducted in London, Birmingham and Manchester in September 2018. 400 face to face interviews; 200 were exposed to advertising on the screen and their responses compared with 200 control interviews who had not seen the advertising. The exposed group represented a rich mix of tourists (51 percent), commuters and city workers (19 percent).